ALLESTREE, Richard [with] DADE, William [and] NEVE, John et. al. I. ALLESTREE, Richard.1635. A new almanacke and prognostication, for the yeere of our Lord God, 1635. Collected and properly referred to the longitude and sublimity of the pole Artick, of 51. deg. 32. mi. London, W. Stansby, for the Company of Stationers, . 8vo. 24 unnumbered leaves. A-C⁸. Roman and black letter, some italic, calendar printed in red and black, title in red and black within fine red and black woodcut border with signs of the zodiac, royal arms above, woodcut diagram of the eclipses, “An appendix vnto the precedent almanacke, for this present yeere of grace M.DC. XXXV.” has a separate titlepage within double box rule, with the imprint: Printed by I. L[egat]. for the Company of Stationers. 1635. Light age yellowing, title dusty, torn with loss to lower outer corner, dust soiling on second leaf. STC 407.18. ESTC S123562. Copies only Bodleian and Folger. II. DADE, William. A new almanacke, and prognostication, with the forraigne computation. In which you may behold the state of this yeare 1635. For the meridian of London. London, Iohn Dawson for the Company of Stationers, . 8vo. 16 unnumbered leaves. A-B8. 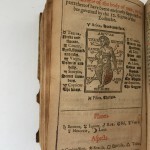 Roman and black letter, some italic, calendar printed in red and black, title in red and black within typographical border woodcut diagram of the Anatomical man, typographical ornaments. “A Prognostication, in which you may behold the state of this yeare of our Lord God 1635.” has a separate title page within a typographical border, with the imprint: “Printed by the Company of Stationers. 1635.” Light age yellowing. STC 435.24. ESTC S125640. One complete copy only at Lambeth, BL has t-p only. III. NEVE, John. 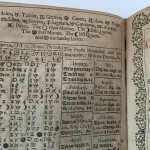 A new almanack and prognostication, with the forraigne computation serving for the yeere of our Lord God, and Saviour Iesus Christ, 1635. Rectified for the elevation of the pole artick, and meridian of the ancient and famous citty of Norwich. London, E[liz.] A[llde] for the Company of Stationers, . 8vo. 20 unnumbered leaves. A-B8, C4. Roman and black letter, some italic, calendar printed in red and black, title in red and black within fine woodcut border with spheres, woodcut diagram of the anatomical man, “A Prognostication serving for this yeare of our Lord God and saviour Iesus Christi 1635” has a separate title page within typographical border. Light age yellowing, tear with loss of text to two lines on B2, the odd spot. STC 490.11. ESTC S125642 One complete copy only at BL, Lambeth has t-p only. IV. WHITE, John. A new almanacke and prognostication for the yeere of our Lord God 1635, : calculated for the meridian of the most honorable citie of London. London, William Stansby for the Company of Stationers, . 8vo. 20 unnumbered leaves. [A]-B⁸ C⁴. 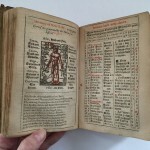 Roman and black letter, some italic, calendar printed in red and black, title in red and black within fine red and black woodcut border with royal arms above, woodcut diagram of the anatomical man, “A Prognostication for this yeare of our Lord God 1635” has a separate title page within typographical border, with the imprint: Printed for the Company of Stationers. 1635. Light age yellowing. STC 527.25. ESTC S2482. One copy only at Lambeth. V. WOODHOUSE, John. A new almanacke and prognostication for the yeare of our Lord God 1635. … More especially for the meridian of the ancient city of Chichester, and the southerne parts. 8vo. 20 unnumbered leaves. A-B⁸, C⁴. 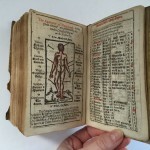 Roman and black letter, some italic, calendar printed in red and black, title in red and black within typographical border, woodcut diagram of the anatomical man, “Wood-house. 1635. A prognostication, contayning the raignes of all the kings, and queenes of this kingdome, since the conquest.” has a separate title page within typographical border. Light age yellowing. STC 531.26. ESTC S90272. One copy only at Lambeth. VI. VAUX, John. A new almanack and prognostication for the yeere of our Lord God, 1635. Calculated for the meridian of the ancient citty of Durham, where the pole is mounted above the horizon almost 55. degrees. 8vo. 20 unnumbered leaves. [A]-B⁸ C⁴. Roman and black letter, some italic, calendar printed in red and black, title in red and black within fine red and black woodcut border with spheres, “Vaux. 1635. A prognostication for the yeere of our Lord God, 1635.” has a separate title page within typographical border, with the imprint: Printed at London for the Company of Stationers. 1635. Light age yellowing. STC 522.15. ESTC S90250. One copy only at Lambeth. VII. SOFFARD, Arthur. A new almanack for the yeere of our Lord God, 1635. Calculated especially for the latitude and meridian of the most honourable citty of London. 8vo. 20 unnumbered leaves. [A]-B⁸ C⁴. Roman and black letter, some italic, calendar printed in red and black, title in red and black within fine red and black woodcut border with spheres, “Soffard. 1635. 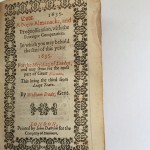 A prognostication for the yeere of Grace, 1635.” has a separate title page within typographical border, with the imprint: Printed for the Company of Stationers. 1635. Light age yellowing. STC 515.18. ESTC S125651. One complete copy only at BL, Lambeth has t-p only. VIII. PERKINS, Samuel. A new almanack and prognosticatiou [sic] for the yeere of our Lord God, 1635. … Composed and chiefly referred to the meridian of the famous citty of London. London, E.A. for the Company of Stationers, . 8vo. 20 unnumbered leaves. [A]-B⁸ C⁴. Roman and black letter, some italic, calendar printed in red and black, woodcut of anatomical man, title in red and black within fine red and black woodcut border with spheres, “Perkins. 1635. A prognostication for the yeere of our Lord, 1635.” has a separate title page within typographical border, with the imprint: Printed for the Company of Stationers. 1635. Light age yellowing. STC 495.10. ESTC S125649. One complete copy only at BL, Lambeth has t-p only. IX. LANGLEY, Thomas. A new almanacke and prognostication in which you may behold the state of his present yeere of our Lord God 1635. Composed for the meridian of the famous city of London. London, William Stansby [and N. O[kes]] for the Company of Stationers, . 8vo. 20 unnumbered leaves. [A]-B⁸ C⁴. Roman and black letter, some italic, calendar printed in red and black, woodcut of anatomical man in red and black, title in red and black within fine red and black woodcut border with Royal arms above, typographical ornaments, ”Langley. 1635. A prognostication for this present yeare of our Lord God, 1635″ has a separate title page within double ruled border, with the imprint: Printed by N. O[kes] for the Company of Stationers. 1635. Light age yellowing. STC 479. ESTC S125185. two copies only, BL and Lambeth. X. WYBARD, John. 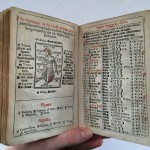 An almanack and prognostication, with the forraine computation, serving for the yeare of our Lord and Saviour Iesus Christ, 1635. Calculated properly for the latitude and meridian o the most famous city of London. 8vo. 20 unnumbered leaves. [A]-B⁸ C⁴. Roman and black letter, some italic, calendar printed in red and black, woodcut of anatomical man, title in red and black within typographical, typographical ornaments. Wybard’s prognostication without separate title page. Light age yellowing. STC 532.9. ESTC S125650, two copies only, BL and Lambeth. XI. PIERCE, Mathew. A new almanack and prognosticaion for the yeere of our Lord, 1635. Calculated for the latitude and meridian of the Citty of Durham, the pole artick being elevated 55. degrees. London, E[liz.] A[llde] for the Company of Stationers, 1635. 8vo. 20 unnumbered leaves. [A]-B⁸ C⁴. Roman and black letter, some italic, calendar printed in red and black, woodcut of anatomical man, title in red and black within fine red and black woodcut border with spheres, typographical ornaments, “Pierce. 1635. 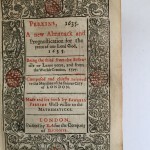 A prognostication for the yeere of our Redemption, 1635.” has a separate title page within typographical border, with the imprint: Printed for the Company of Stationers. 1635. Light age yellowing. STC 496.2. ESTC S125652. One complete copy only at BL, Lambeth has t-p only. XII. JEFFEREYS, Thomas. A new almanacke and prognostication for the yeere of our Lord Iesus Christ. 1635. Calculated, erected, and especially referred to the latitude and meridian of the ancient towne of Dorchester in the county of Dorset. London, William Stansby [and John Norton] for the Company of Stationers, . 8vo. 20 unnumbered leaves. [A]-B⁸ C⁴. Roman and black letter, some italic, calendar printed in red and black, title in red and black within red and black woodcut border with royal arms above, large woodcut diagram of the anatomical man on A2 verso another with another on verso of the title of the prognostication, typographical ornaments, “Jeffereys. 1635. 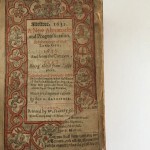 A Prognostication, written by Thomas Jeffereys, this present yeere of our Lord Jesus Christ, 1635” has a separate title page within double ruled border, with the imprint: Printed by I. N. for the Company of Stationers. 1635. Light age yellowing, verso of last soiled, the last few leaves a little dog-eared. STC 464.7. ESTC S125667. Three copies only, British Library, Durham University Library, Lambeth. A sammelband of twelve volumes. Very good copies, generally crisp and clean, in contemporary polished vellum, yapp edges, covers bordered with a double gilt rule, gilt arms of Charles I at centres, spine triple gilt rued in compartments, large fleurons gilt at centres, all edges red (faded), remains of ties, a little soiled, outer edge of upper cover a little chipped, block loose in binding. 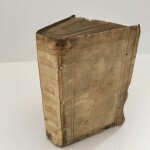 An extraordinary collection of twelve almanacs, all for the year 1635, and all of the utmost rarity, many surviving in a single copy and many recorded with just the title page, all preserved in a very good contemporary binding with the Royal arms. Whether this collection was made for presentation to Charles I, or simply gathered over the year 1635 and bound by a royal institution is not known, but they form a large part of all the almanacks published in the year 1635. These Almanacks were all printed in London but provided prognostications for specific places. Jeffereys was made “to the latitude and meridian of the ancient towne of Dorchester in the county of Dorset,” others were made for Durham, Chichester, and Norwich. All these exceptionally rare almanacks are complete with the interesting Prognostication (or ‘Appendix’) called for on the title-page, which are often missing from almanacks of this period. The ephemeral and popular nature of these almanacks provides a most interesting and rare insight into the lives of ordinary people, revealing their daily concerns and routines. The ordinary users of almanacks often made their way into contemporary literature. “The writers of this age thought of the Almanack and prognostication with mixed feelings: it was a thing of eternal humour as it had been to Pico, Turnebe, Montaigne, and others before them; and it was, too often, the sole furniture of many private libraries, the untrustworthy source of faith and learning for numerous foolish and simple Englishmen. That it was the superstitious and the untutored who were the regular purchasers of these catchpenny publications is suggested by the reliance of Shakespeare’s mechanic actors on an almanack. By similar instance, in ‘The Witch of Edmonton,’ Jonson sends the childish Abel Drugger to consult Subtle about the rubrication of his almanack, and draws the picture of Sordido, who is one of the prognostication-trusting farmers Fulke or Perkins brought to life. … Webster, whose skill in astrology has been recognised, describes a lying character as an almanack-maker.” Don Cameron Allen. The Star-crossed Renaissance: The Quarrel about Astrology and Its Influence. The almanacks provide such things as “Husbandry instructions” for each month of the year, even weather forecasts for the entire year. 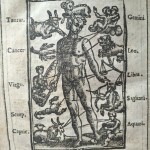 “General Rules of Physicke” suggest that one should “cut no veyne nor let no blood, when the sign is in the place where the incision is to be made,” with reference to the zodiac on the anatomical man. There are adverts for lawyers’ services, offering “an abstract of a direction, concerning Real Contracts,” and lists of the principal “Fayres of England” with their dates, with pages on forthcoming eclipses, and aspects of planets and definitions for astrological terms. An extraordinary, unique collection of these most ephemeral and rare publications. In Early Books, Subjects & Interests Tagged Astrology, Economics & Trade, Food & Drink, Medicine Bookmark the permalink.